In recent months, Apple has dedicated several new sections of its website to ads and causes the company is passionate about. The latest, unveiled Tuesday, centers around the company’s diversity and inclusion policy. Apple created a new video for the page, which also includes a letter from CEO Tim Cook and demographic details on the company’s 98,000 U.S. employees. 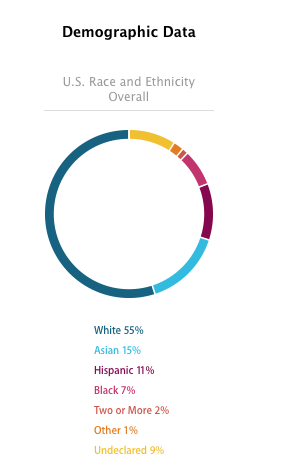 The published data understandably steers clear of the more private aspects of such information, focusing instead on traditional diversity statistics: race/ethnicity and gender in Apple’s non-tech, tech, and leadership fields. The company’s gender balance is, like the rest of the tech industry, a little less than thrilling: Only 30 percent of Apple’s U.S. workforce is female, with only 20 percent in technical positions and 28 percent in leadership positions. That said, three of the four recent senior executive hires that Cook highlights in his letter are women: Angela Ahrendts, Lisa Jackson, and Denise Young-Smith. Recent board of directors addition Sue Wagner also merits a mention. To see the details—or if you simply want to see a minute’s worth of smiling faces—check out Apple’s entire webpage.